What do we have here? 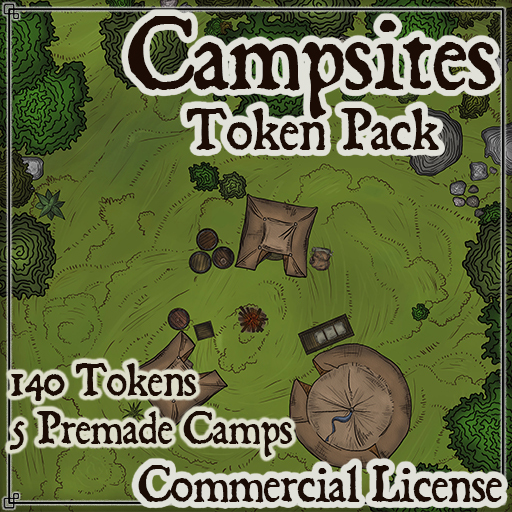 It’s a token pack for outdoors campsites! All assets are hand-drawn, they have an organic feel and there are enough tokens and variation to create lively locations. All tokens come with night and day versions. The backgrounds are just an example but I included several variations for them. All assets are labeled with the dimensions in squares to look properly in the Roll20 tabletop (i.e 4×4). The tokens are created at 280px resolution. This pack contains over 140 different tokens and several backgrounds. I have included 5 prebuilt camp locations ready to drop for an instant bang-for-your-buck.